“Hispanic heritage doesn’t have to do with any land or any will or any testament or money or goods,” said Redemptorist Father Robert Wojtek in an abbreviated, English version of his homily at the 2015 Archdiocese of Baltimore Hispanic Religious and Cultural Heritage Mass. “It has to do with a spiritual heritage we’ve received by the Holy Spirit, and it includes our culture as well as our faith,” Father Wojtek added at the Sept. 19 Mass at the Basilica of the National Shrine of the Assumption of the Blessed Virgin Mary in Baltimore. Spanish-speaking parishioners from across the archdiocese, with Latin American heritage from Mexico to Chile, gathered for the liturgy which included dance and musical performances and a post-Mass meal. Concelebrating with Father Wojtek, pastor of Sacred Heart of Jesus-Sagrado Corazón de Jesús in Highlandtown, were Redemptorist Father Uriel Useda, associate pastor of Sacred Heart of Jesus-Sagrado Corazón de Jesús, and Father Hilaro Avendaño, associate pastor for Hispanic ministry at Sacred Heart in Glyndon. Deacon German Flores of Holy Trinity in Glen Burnie assisted. 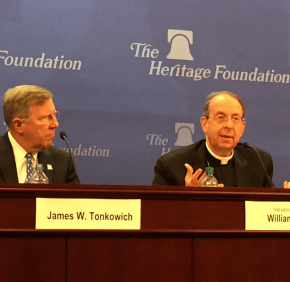 Father Wojtek noted that in addition to their heritage, the archdiocese’s Hispanic Catholics bring an “inheritance” that includes the values of family, work, generosity, religiosity and sacrifice. “After the apostles passed on what we’ve received from Jesus, that’s also part of our inheritance,” he added. Zeny Peralta and others from St. Clement I in Lansdowne celebrated their heritage with an Aztec-inspired dance prior to the Mass. Adding to the peacock-feather headdresses and traditional Aztec garb were sequined images of Our Lady of Guadalupe. “We celebrate with God, and we say thank you to God for our staying in the U.S.,” Peralta said. Herbierto Martinez, a parishioner of Holy Trinity, said he enjoyed the Mass, especially Father Wojtek’s homily, which noted that Hispanic heritage in what is now California and Arizona predates the history of the U.S. itself. “That is a personal point of mine,” said Martinez. Also attending the Mass were José Luis, 29, and José Nair, 26, both originally from Honduras. The two were injured in separate accidents involving “the Beast,” a freight train network that migrants use as they pass through Mexico on the way to the U.S. border. Attempting to board the moving train, Luis lost his right arm, much of his right leg, and three fingers from his left hand. Nair lost part of his right leg. “They both had the same motive – looking for the American dream,” said Father Wojtek, who served as translator in an interview with the pair. Luis and Nair attended the Mass while six of their companions protested near the White House. All eight were in the midst of a hunger strike. Luis and Nair said that they had not eaten in five days and hoped to make it to 10. According to Luis and Nair, many are fleeing Latin America due to violence, poverty and a lack of jobs. Gangs have become a severe problem, recruiting even young children as drug mules, according to the pair.